Find out more about the Lorex Complete 16 Camera Security System with Monitor. Includes pricing, features, and FAQs. The Lorex Complete 16 Camera Security System with Monitor is an HD analog surveillance monitoring system and security cameras by Lorex. Along with a DV700 DVR, the system comes with 16 high-definition, all-weather cameras, and a 24-inch monitor. 12 1080p bullet + 4 1080p dome cameras. Pros: Easy to set up. Easy to manage. Eco-friendly monitor. Cons: Customer service could be better. 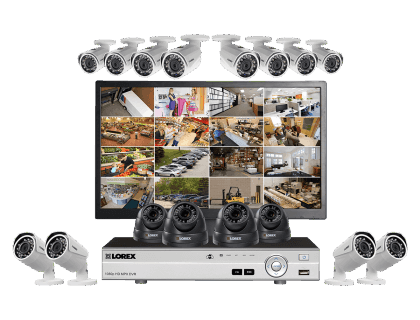 Bottomline: The Lorex Complete 16 Camera Security System with Monitor is an affordable, robust, comprehensive system, under a great warranty. What are some Lorex Complete 16 Camera Security System with Monitor alternatives? Where can I buy the Lorex Complete 16 Camera Security System with Monitor security camera system? The Lorex Complete 16 Camera Security System with Monitor is available on Amazon and on the Lorex website. Does the Lorex Complete 16 Camera Security System with Monitor work at night? Yes, the cameras all have a night vision range of up to 150 ft. in low light and up to 100 ft. in complete darkness. Can the Lorex Complete 16 Camera Security System with Monitor be used in any weather? Yes, the cameras rate very high for dust and rain resistance and can operate in temperatures from as low as -22 degrees to as high as 140 degrees.